The National Homebrew Competition boasted one of the most competitive fields of entries ever, with 8,172 homebrews judged in 2014. The American Homebrewers Association (AHA) awarded the best homebrewers for their efforts at the conclusion of the National Homebrewers Conference, held at DeVos Place in Grand Rapids, Mich.
With a 45 percent increase in the number of competitors, this year’s National Homebrew Competition is the world’s largest beer competition. 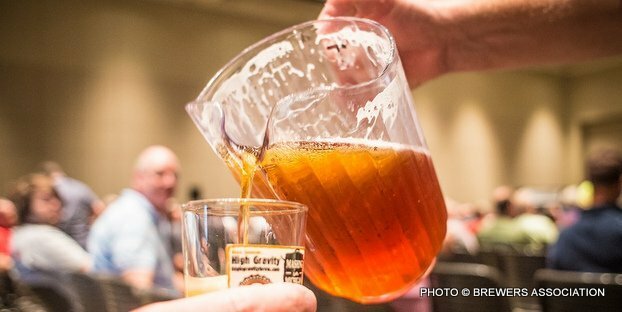 The top three entries from 28 style categories at each of 12 first round judge centers advanced to the final round of competition at the National Homebrewers Conference. There, 1,020 entries were evaluated by 212 of the country’s top beer judges. Robert Hilferding of Zephyrhills, Fla., won the Homebrewer of the Year award with his best-in-show entry in the Scottish and Irish ale category. The Meadmaker of the Year award was presented to Matthew Weide of Minneapolis, Minn., for his melomel and Edward Walkowski from N. Abington Twp., Pa., won the Cidermaker of the Year award. Jeremy Voeltz was recognized as the winningest homebrewer in the final round with the Ninkasi Award. He hails from Lakeside, Ariz., and brews with the Arizona Society of Homebrewers. Homebrew clubs were also recognized at the award ceremony in Grand Rapids. The Brewing Network narrowly won their fourth Homebrew Club of the Year award — a mere six points separated them from the runner-up, QUAFF. The Gambrinus Club award was given to the Minnesota Home Brewers Association. New for 2014, the Radegast Club of the Year award was presented to the AHA-registered club that made the most exceptional and positive impact on its local community. The Carolina BrewMasters of Charlotte, N.C., earned that honor by developing close connections with their local community through tremendously successful charitable donations, which amounted to $77,500 in 2013. A total of 25 homebrew clubs were nominated for the Radegast award, and then were reviewed and voted on by an impartial panel of judges from the AHA Governing Committee and select members of the brewing community. The Carolina BrewMasters will receive a stipend of $500 for the club as well as a $500 donation to the charity of the club’s choice. A complete list of 2014 National Homebrew Competition winners can be found on HomebrewersAssociation.org. Plus, conference attendees were treated to some of Michigan’s best beer. The Michigan Brewers Guild played an instrumental role in curating an impressive list of more than 50 breweries from around the state to serve the homebrewers at the event’s Welcome Reception.